The Greer Building: Ghosts Hate Overtime! 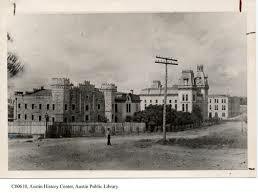 The old Travis Country Jailhouse was a fortress-like structure built in 1876. It had a center courtyard with gallows where nine men met the end of their rope. John Wesley Hardin, the deadliest outlaw in Texas in the 19thcentury cooled his heels there, as did another famous bad guy, Johnny Ringo. By the late 1920s, the jail had begun to show its age. And the adjacent county courthouse at 11th and Congress (to the right in the picture above) had bats in its belfries, so both structures were demolished. The Greer Building that houses the Texas Department of Transportation now stands where the old jail was, designed by San Antonio architect Carleton Adams and completed in 1933. 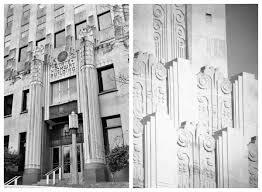 The nine-story building cost $455,000 and features sumptuous Art Deco styling, including decorative carved limestone panels above the front doors. At night, it looks like a set piece that belongs in a Tim Burton film, and the ghostly goings on inside are just as weird. In fact, state employees who have worked in the Greer building report the oddest variety of haunted activity that we have ever heard. A state employee told us of a time when she filled in answering the phones after hours when the Houston area was experiencing tremendous flooding. She felt uneasy when she took her seat in the lobby and the night watchman said he was going to go away, but he’d back at 10PM. She reported that at about 7PM, some invisible yet strangely all-encompassing presence filled the lobby, as though it came downstairs to see just what was going on. It felt like something was curious she was there. By 9 pm, the employee was feeling that whatever or whoever it was, it was very annoyed. “Jeez, do you have NOWHERE else to be?” (Yes, it was just like that!) By 9:30 pm, she was VERY nervous because she felt this presence was about to get a bit hostile, so she shouted between calls: “Living people have a right to be here, too!” which made absolutely no sense whatsoever, but she felt better saying it. Finally, at 10 pm the night watchman returned and when the overworked employee opened the front door to leave, the door slammed unusually hard on the back of her heel, as though someone couldn’t WAIT for her to be gone! Other stories you might hear on tour include a restless judge, doors that cannot slam yet still do, and a night watchman’s visitation from a phantom schoolboy. There are stories a-plenty about the Greer Building as well as other state facilities. Join Austin Ghost Tours for first-hand accounts of haunted history! We’re a year-round company, ready to walk in rain or showered by starlight, anxious to share our stories with you. And who knows, you might end up with a story to tell yourself!